In the religion of the Hindu, Vedas occupy the foremost position, as they are revelations free from defects. Then come the Smrtis, switch are products of human recollection of Vedic revelation. Next come the Puranas, which are narratives which substantiate the truth of the first two, i.e., Sruti and Smrtis. They are primary creation of the world (Sarga), dissolution and recreation of the world (Pratisarga) genealogical descent of the gods, racial progenitors and sage (vamsa), Periods of the Manus who preside over dissolution and recreations (Manvantara), history of royal dynasties, past, present and future (Vamsa nuchararita), Most of the Mahapuranas as current now, do not confine themselves only to the treatment of the above five topics. Quite often, the topics are dealt with in a general manner and several other secondary matter related to religious worship are included. And then there are Puranas which narrate the glory and detail about deities. Thus, Svapurana describers the incarnation and matter connected with Siva, Visnu Purana descirbes those of Visnu. Similarly, Devi Bhagavata gives the details regarding Devi. Devi Bhagavata is stated to be a Mahapurana. Devi Bhagavata is the most supreme. 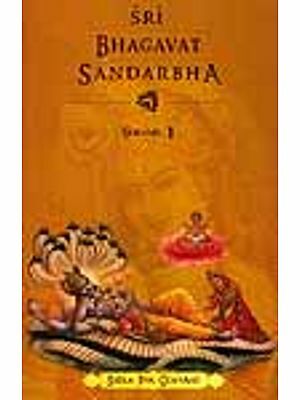 It bestows Dharma, desires, wealth and liberation to the readers. Like Srimad Bhagavata, this is also very holy and fulfil all desires of the devotees. The glory of Devi Bhagavata is given in Manasa Khanda of Skanda Purana. It is not an ordinary Purana. It is a very holy one. Like Srimad Bhagavata, Ramayana etc., the reading of Devi Bhagavata is also done frequently at many places, for the fulfillment of desires. For those who hear Devi Bhagavata story, success is not away. It should be always read by men for the fulfillment of their desire. Reading of Devi Bhagavata in a period of nine days is called navaha yajna. (sacrifice which is completed in nine-days) It is considered to be very holy and wish-yielding. The Purana literature is very ancient. The name Purana occurs in Brhadaranyaka Upanisad, Gopatha Brahmana, Tattiriya Aranyaka, Chandogya Upanisad, Satapatha Brahman etc. but most of the existing Puranas, though containing much old material seem to be late compilations. It appears, Purana must have been recast after the second or third century after Christ. The line occurs in Taittitriya Aranyaka. So, there is no doubt about the fact that Puranas have been in existence since yore. The Bhavisyat Purana is mentioned in Apastamba Dharma Sutra (Chapter III). Apastamba is earlier than the 3rd century B.C. According to F.E. Pargiter (Ancient Indian Historical tradition, Chapter IV), the Bhagavata Purana cannot be placed rater than the early part of 3rd century B.C. and even possibly earlier still by 150-200 years. Later on many interpolations were made and the Bhavisyat Purana which is available in print mentions even Akbar, Humayun etc. similarly it is clear that most of the Puranas were revised from time to time. Ancient Indian Historical Tradition, Pargiter says that the Bhagavata Purana was composed about the ninth century A.D. But it contains much old material. Sri Sankaracarya has not quoted this Bhagavata Purana is his Bhasyas. He has quoted Visnu Purana, Mahabharata etc. but not Srimad Bhagawata. So, it is possible, that Bhagavata was completed around the ninth century. It mentions Alwar saints of South India, vaguely, and they belonged to seventh, eighths centuries of A.D.
R.C. Hazra a great scholar on Puranas holds that the existing Puranas were compiled between 3rd century A.D. and 12th Century A.D. Note : For Further details see Studies in Puranas by R.C. Hazra, and History of Dharmasastra by P.V. Kane. Devi Bhagavata also seems to be a late work. As it contains details given in Saptasati part of Markadaya Purana, it must be placed after the sixth century A.D. 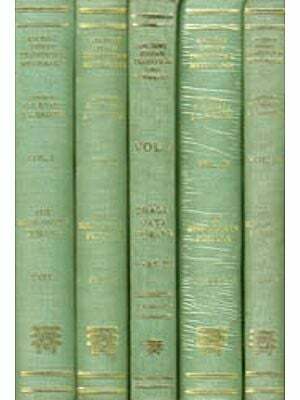 But this great work also contains much old material and its importance is in no way small. Both Bhagavata and Devi Bhagavata contain 18,000 slokas each. 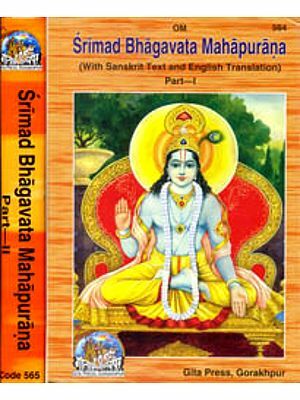 Some hold that Bhagavata is the Mahapurana and Devi Bhagavata is, an upapurana. But Sankta do not agree to this, they hold that Devi Bhagavata is the Mahapurana. Both Bhagavatas are important for us because reading them is considered as holy equal to performing a Yajna through which all desires can be fulfilled. Note : Which is the Mahapurana, Bhagavata or Devi Bhagavata? Many research papers have appeared in this regard. For a brief account see P.V. Kane's History of Dharma Sastra (section on Purana). Devi Bhagavata mentions Minaksi of Madura, Kanchi, Chidambara, tulajapura, Kolhapura etc. of south India. The world Bhagavata can be interpreted and derived in two ways. That which pertains to Bhagavata, i.e. Lord Visnu and in this way it will mean Visnu Bhagavata. We can interpret the world also as that which belongs to the goddess and in this way the world Bhagavata will mean Devi Bhagavata. Both contain 18000 slokas and are divided into 12 Skandhas. In the Purana literature Bhagavata occupies the 5th place. The narrator of this Devi Bhagavata is Veda Vyasa and Janamejaya is the hearer. This Janamejaya is the son of Parksit, to whom suka narrated (Visnu) Srimad Bhagavata at Gangadwar. By a study of Devi Bhagavata, it become clear that Devi (mother goddess) is the supreme god. She is the qualitless eternal and omnipresent, Para Brahman. She is Saguna Brahman also by her Maya Sakti. She is extremely benevolent and kind. She is attainable through yoga and Bhakti. She has three powers Sattvika, Rajasika and Tamasika They appear as Lakshmi, Sarasvati and Kali, Through her Rajasika power; she creates, through Sattvika, power, she protects. And by her Tamasika power she destroys. All the Puranas speak about the one supreme Brahman. In Visnu Purana, Visnu is the Supreme Brahman. In Siva Purana, Linga Purana etc. Siva is the supreme Brahman. According to Devi Bhagavata, Devi is the supreme Brahman Sakti is the Paramatman. Paramatman is the Sakti. Three is no difference between them. The Purana in which Dharma is told in detail, based on Gayatri and the killing Vrtrasura is also described, is called, Bhagavata. Devi Bhagavata satisfies this condition. Details regarding Gayatri are given in the eleventh and twelfths Skandhas. Vrtrasuravadha is also described in it. as told earlier, Devi Bhagavata contains much old material. But it mentions names of Mauryas, Hunas, Mlecchas and Yavanas. clearly So, it must be a late Purana compiled between 600 A.D. to 1000 A.D.
As Bengal influence is seen, some say it might have been written in Bengal. In Bengali Sakti worship was very much prevalent. The glory of Mangala Candi, a form of goddess worshipped in medieval Bengal is found in Devi Bhagavata. Others hold that it was written outside Bengal probably in Benaras very much. Morever, the main goddess described is a very benevolent, kind, from of Devi is Bhuvaneswari. Commentary : This was commented upon by Nilakantha in the 18th century. There might have existed earlier commentaries too. The great Sakta Acarya, Bhaskara Raya, is said to have popularised Devi Bhagavata in south India. 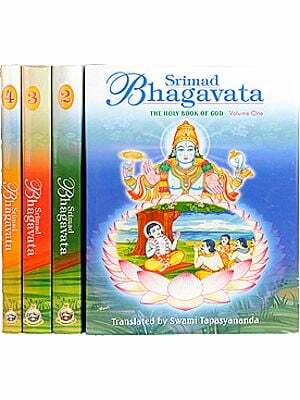 Content of Devi Bhagavata The Devi Bhagavata contains 12 Skandhas, and 318 Chapters. Skandha I : Details regarding Puranas Devi Bhagavata is a Mahapurana Devi's glory, Killing of Madhu and Kaitabha by Visnu, Pururava's story, Suka's birth, Budha Pururavas and Urvasi, Suka studies this Purana, Suka goes to Mithila and his advice to Janaka. Skandha II : Story of Prasara, birth of Vyasa. Pandavas, Extinction of yadus, Parksits death by the bite of Taksaka, Sarpasatra, Astika. Glory of Devi Bhagavata. Skandha III : Janamejaya's question to Vyasa. Narada's description of Devi Bhuvaneswari and her worship. Brahma, Visnu and Siva see Devi and Praise her. Description of Devi as Bhuvaneswari. Story of Satyavrata, Vagbija. Ambajana. Nature of gunas. Stories of Visvamitra, Sudarsana etc. Navaratrata, Story of Ramayana worship of Devi by Rama. Skandha IV : Janamjaya's question regarding Krsnavatara. Vyasas advice to Janamejaya. Kasyapa brith as Vasudeva, Stories of Narayana, Prahlada snd sukra. Avataras of Hari. Story of Krsna, Pradymna etc. Skandha V : Devi Mahatmya. (Glory of Devi) Mahisasura. Fight between Devi. Praise of Devas. Destruction of Dhumralocana, Candamunda, Raktabija, Sumbha and Nisumbha. Description of Bhuwana Sundari. Skandha VI : Killing of Vrtrasura by Indra Stories of Sunasssepa, Haihayas and Nahusa Place sasred to Devi. Skandha VII : Lineage of Surya and Soma. Story of hyavana and Sukanya Sacrifice by Sacrifice by Saryati. Stories of Satyavrata and Hariscandra. Devi Bhuvaneswari. Parasakti. Place sacred to Devi. Devi Gita. Method of worship of Devi. Skandha VIII : Devis boon to Manu, Visnus incarnation as a boar, Manu Vamsa, Priyatara Description of earth. Varsas, Dvipas. Mountains Planets, Dhruva Mandala, Rahu, Descriptiona lower regions Atala, Vitala etc. Description of hells, Sins and punishments for them worship of Devi. Skandha IX : Description of Sakti in brief, Worship of Sarasvati Stories of Ganga, Tulasi, Sankhacuda Worship of Tulasi. Story of Savitri Glory of Devi, Stories of Mahalaksmi, Mangala candi, Radha, Durga etc. Skandha X : Svayambhuva Manu, Vindhya Mountain and Agstya. Stories of Svarocisa, Caksusa, Savarni and other Manus. Mahakali Mahalaksmi, Mahasarasvati and their stories. Skandha XI : Daily routine, nanavidhi wearing of Rudraksa beads. Description of Rudraksas, Bhutasudhi, Sirovrata, greatness of Bhasma (Sacred ash). Importance of Tripundra Urdhva pundra marks on the forehead. Sandhyopasana, Brahmayajna, Gayatri Purascarana, Vaisvadeva, Prayascittas. Skandha XII : Rsi etc. of Gayatri. Gayatri Kavacam, Gayatri Hrdayam, Gayatri Sahasranama, Dscription of Manidvipa, Cintamani grha, Deviyajna. Conclusion and results which accrue by a study of this Purana. The glory of this great Purana Devi Bhagavata as described in Mansa Khanda of Skanda Purana, Devi Bhagavata is a Mahapurana. We meditate upon the first Vidya who is of the form of all consciousness. May she impel our intellect. She is the Parasakti, great goddess, Mahamaya. The main deity of his great wok is goddess Bhuvaneswari a benign form of Devi. She lives in Manidvipa. Description of Manidvipa is given in 12th Skandha 10th, Adhyaya. Description of her palace, Cintamanigrha are all young and enjoying all comforts, through the worship of the goddess. The Goddess is extremely beautiful and kind. She always fulfills the desires of the devotees. She wards off all evil and takes care of her devotees in every way. For a devotee of Devi there is nothing unattainable in this world. Thus, this Purana gives immerse strength to the devotees. She is Maya and Brahmavidya too. She is Sakti (power). She is the supreme Brahman. She is the nimittakarana (instrumental cause) as well as Upadana karana (maternal cause) of the universe. In the ninth skandha of Devi i.e., importance of the five froms Durga, Radha, Laksmi, Sarasvati and Savitri is declared. Devi is Prakrti. She is Durga; Radha Laksmi, Sarasvati and Savitri. In this way, through one, she is known in five froms. She is Saguna Brahman. She is Isvari. She cannot be known easily. Only Jnanins can realize her. Mahavakyas are the means to know her. Great Jnanins like Bhagavan Sri Sankaracarya, Sri Gaudapada, Sri Bhaskara Raya, of ancient times were all worshippers of Devi. Sri Sankaracarya has composed Soundarya Lahari in praise of the goddess. In Sankara mutts, even to-day worship of Devi continues in an elaborate manner. Even saints like Sri Ramakrishna Paramahamsa Sri Karapatra Swami etc. of recent times, were worshippers of Devi. She is the Adya Sakti i.e., first power. O mother of the universe! Those who worship you as Ambika, Jaganmaya, Maya etc. attain all objects of desire. The entire universe in her form. Everything in this universe is pervaded inside and outside by her. There nothing that is left off by her. The rope in darkness appears as snake. In the same way, Devi appears as Isvara, Visnu, Brahman etc. In reality Jiva, and Isvara are all one. The difference is produced only by Maya. Avidya is the cause of difference of Jivas from Brahman. There is no other cause for this difference. The universe is imposed on the base (substratum) Para Brahman. By the existence of Brahman, the universe exists. And that Parabrahman is Devi herself. When Devi declared that she is every thing is this universe and there is nothing that is not pervaded by her, Himavan wanted to see her cosmic form (Viswarupa). She shows that cosmic form to Devas, Brahma, Visnu etc. (See VII Skandha, 33 rd Adhyaya). Seeing the cosmic form the Devas were terrified. They fainted and fell down. They requested her to show the benign form again and withdraw the cosmic form. Seeing the Devas terrified, Devi, the ocean of mercy withdrew her terrific form and showed her extremely beautiful benign form. She was having noose, ankusa (good) in her upper hands. By her lower two hands, she was giving boons, and refuge from fear. Her ayes were full of compassion. Her lotus-like face was giving a gentle smile. Seeing her beautiful form, the Devas were free from fear. They became peaceful. They bowed down and praised her with joy. Their voice was faltering due to joy. We are reminded of the 11th Adhyaya of Srimad Bhagavad Gita wherein Lord Krsna shows his comic form to Arjuna after seeing the Visvarupa, Arjuna was convinced once for all that Lord Krsna was none other than Parabrahman. Thus, we find the quintessence of all Vedanta in this great purana. Pure Advaita is taught here, which is set forth in the great Upanisads. Worship of Nirguna Brahman is very difficult for ordinary people. Only great Samnyasins and Jninas are qualified for it and are capable for it. But the goddess Devi can be worshipped by all. And every thing including liberation can be got through her grace. In Devi Gita we find the essence of all Upanisads set forth in a very clear easy form. in the 3rd Skandha, 3rd Adhyaya, of Devi Bhagavata description of Bhuvanesvari is given. In the midst of the ocean of nectar, in Manidivpa, she is seated on the couch of Siva. she is having in her hands noose, Ankusa (good) Vara (boons) and Abhista (all that is desired). No deity has ever been seen equal to her in beauty. She is extra ordinary beautiful. She is smiling and that smile itself is like an ornament for her. She is reddish in color. She is the personified form of compassion. She is a Kumari in her fresh youth. She is served and worshipped by those ever engaged in chanting the mantra Hrim. in the 24th Adhyaya, the installation of Durga in Kasi is told. in the 4th Skandha is told the story of Sri Krsna in detail. Siva advises Sri Krsna to worship Remembrance of the feet of devi makes the birth fruitfull. One should meditate on her as Brahman and as "I am that Brahman". She should be meditated upon as one's own Atman. By this, one gets released from Samsara. By crores of rituals, one cannot get liberation The sages Svetasvatara etc. got release from the Samsara thus. (For Details see Svetasvatara Upanisad). the exploits of Durga, her slaying Asura Such a Mahisasura, Raktabija, Dhumralocana, Canda munda, Sumbha and Nisumbha are told in the fifth Skandha this discription closely follows Devi Mahatmya, i.e. Saptasati, which is a part of Markandeya Purana. In the sixth Skandha, the power of Mahamaya is described. The Jiva is helpless and is under the control of Maya. If Brahma, Visnu and Siva are under the sway of Maya, what to talk about others? That Maya remains in Brahman and all the Jivas. Devi in the goddess controlling Maya. One should meditate on her. One should worship her. One should bow to her. One should chant her mantras. By this she becomes kind and releases the Jiva from Maya. Devi is pleased only by good conduct. This is given in the eleventh Skandha, in great detail. Even if the four Vedas are studied along with the six Angas, (Siksa, Kalpa, Vyakarana, etc.) they do not purify a person devoid of good conduct. The Vedas leave him at the time of death even as the birds leave the nest and fly away, when the wings are born. Radha, her worship etc. are described in this Devi Bhagavata. But in Srimad Bhagavata, Radha is not mentioned anywhere. The story of Tulsi, method of her worship etc. are found in the ninth skandha of this Purana. 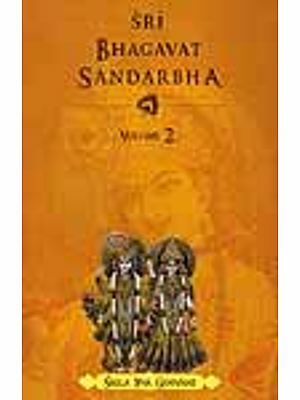 Story of Savitri is given in detail in the ninth skandha, in Adhyayas 26 to 38. Yama gave Satyavan back to her, with blessings and advices regarding Dharma. 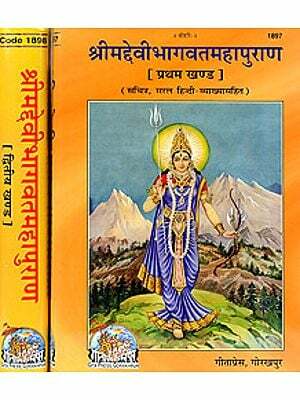 This Devi bhagavata is a great encyclopaedia containing many stories, modes of worship, mantras rules of code of conduct etc. Second day upto IV Skandha, 8th Adhyaya. Third day upto V Skandha, 18 th Adhyaya. Fourth day upto IV Skandha, 18 th Adhyaya. Fifth day upto VII Skandha, 18th Adhyaya. Sixth day upto VIII Skandha, 17th Adhyaya. Seventh Day upto IX Skandha, 28 th Adhyaya. Eight day upto X Skandha, 13 th Adhyaya. Ninth day upto the end of XII th Skandha. This purana was published in 1922, with the translation of Swami Vijnanananda, from Allahabad. The present editions a reprint of the same with Slokas in Sanskrit. We hope that, it will be extremely useful to the readers, and will be welcome by them.